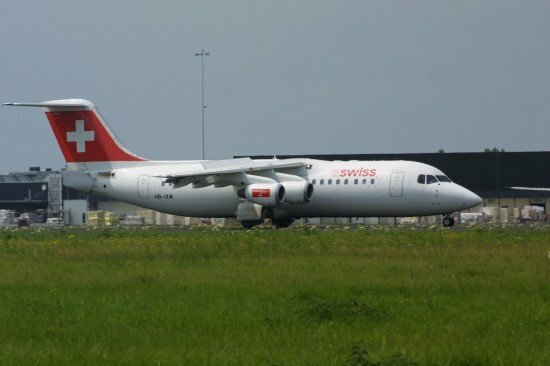 The Swiss Accident Investigation Board resleased their final report in a serious incident involving a loss of cabin pressure on an Avro RJ100 jet. The incident happened on July 2, 2012. One day prior to the incident, the crew of a Swiss Avro RJ100 (HB-IXW) had complained of a smell of burned oil on the flight deck. Engineers identified the cause but were unable to rectify the issue before the airplane needed to be released for service for the morning flight LX-456 from Zürich to London-City Airport. Consequently airconditioning pack 1 was deactivated. The flight departed at 09:47 UTC with 93 passengers and four crew members on board. After a flight time of approximately 22 minutes and when in climb at FL244, various warning lights illuminated, including the R ZONE HI TEMP warning. This warning triggered several automatic shutdowns, including the shutdown of airconditioning pack 2. At this time, the aircraft was 24 NM south-east of the Rolampont omni-directional radio beacon (RLP) in France. Since airconditioning pack 1 was already deactivated at the commencement of the flight, the cockpit crew realised that cabin pressurisation was no longer ensured and that the pressure inside the aircraft would drop. The crew donned their oxygen masks. A good minute after the first alerts, the CABIN HI ALT warning light illuminated. The crew reported the emergency situation to the Reims Control air traffic control centre and initiated an emergency descent. Shortly afterwards the oxygen masks in the cabin were automatically deployed. These were donned by the passengers in accordance with the cabin crew’s instructions. At 10:15 UTC the aircraft reached FL 100. After a detailed analysis and assessment of the situation, the crew decided to return to Zürich. The approach and landing were uneventful. None of the passengers or crew was injured. The serious incident is attributable to the fact that after a defect in the right bleed air system the cabin pressurisation system failed completely at FL 244 (7437 m) and the crew were forced to make an emergency descent to a safe altitude. The fact that airconditioning pack 1 had been deactivated prior to the flight contributed to the serious incident. No safety recommendations were issued.